Low-energy ventilation. The Venmar EKO 1.5 is a heat-recovery ventilator (HRV) equipped with two ECM blowers. At low speed, the energy-efficient appliance draws only 13.5 watts to deliver 40 to 80 cfm of fresh air. After investigating various ventilation options, many residential designers conclude that they want either a heat-recovery ventilator (HRV) or an energy-recovery ventilator (ERV). They often remain confused, however, about which of the two devices to choose. 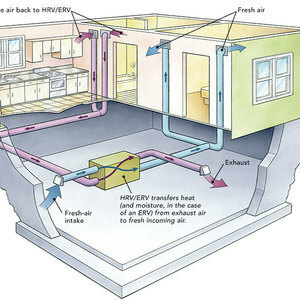 The purpose of an HRV or an ERV is to deliver fresh air to a home’s interior. Neither appliance is designed to provide makeup air for combustion appliances or kitchen exhaust fans. HRVs and ERVs are not space-heating devices, heat-delivery devices, or energy-saving devices. The more hours that an HRV or ERV operates, the more energy it uses — electrical energy to operate its fans, as well as heating or cooling energy to make up for the conditioned air that these devices expel from a home. An HRV’s fans pull fresh air into a home while simultaneously exhausting stale air from the home. In most installations, the fresh air is delivered to the living room and bedrooms, while the stale air is removed from bathrooms, laundry rooms, and sometimes the kitchen. Both the fresh air stream and the stale air stream flow through the HRV. The core of the appliance allows some of the heat from the warmer air stream (the stale air in winter, the fresh air in summer) to be transferred to the cooler air stream. In winter, in other words, the appliance “recovers” some of the heat that would have otherwise been exhausted. This heat transfer occurs without any mixing of the two air streams. Most of these goals are easy to understand. (Even so, establishing an optimal ventilation rate to achieve these goals is a contentious issue.) However, using ventilation to achieve the last of these four goals — lowering the indoor relative humidity — gets problematic. Ventilation can only reduce the indoor relative humidity if the outdoor air is dryer than the indoor air. Since cold air can’t hold as much moisture as warm air, ventilating a house helps lower the indoor relative humidity only when it’s cold outside (or on dry days during the spring and fall). In most parts of the U.S., ventilation during hot weather actually introduces more moisture into the house — that is, it tends to raise rather than lower the indoor relative humidity. The Fantech Web site and Lennox advise readers that the only relevant criterion is climate. ERVs can’t be used in cold climates because their cores will freeze. In a humid climate, an ERV can act as a dehumidifier or can help address high indoor humidity. When an HRV or ERV ventilates an air-conditioned house during the summer, the cool exhaust stream absorbs heat from the incoming fresh air. In other words, the incoming outdoor air is cooled by the outgoing exhaust air. This is only possible in an air-conditioned house. If there’s no air conditioning, the exhaust air won’t be cool, so there is little opportunity for heat exchange to occur. In a hot, humid climate, it makes more sense to install an ERV than an HRV — but not for the reason that many people assume. “ERVs are not intended to reduce indoor relative humidity during the summer,” explains Daniel Forest, the vice president of R&D for Venmar, a manufacturer of HRVs and ERVs. Operating an ERV during the summer in Houston, Texas, doesn’t lower the indoor relative humidity; rather, it makes the situation worse. The best that can be said is that, from a moisture-load perspective, operating an ERV is less bad than operating an HRV — assuming, of course, that the home is equipped with a dehumidifier. The main reason to prefer ERVs over HRVs in Houston is that the additional moisture introduced by the ERV — a latent load that the air conditioner must contend with — is less than the moisture that would have been introduced by an HRV. While HRVs and ERVs both cause increased energy use, the energy attributable to ERV operation is less. In Houston, a tight, well insulated house is more likely to have problems with high indoor humidity than an older leaky house. In a tight home, an air conditioner doesn’t run anywhere near as often as in a leaky home, especially during the swing seasons (spring and fall). If the air conditioner is rarely on, there are fewer opportunities for the HVAC equipment to dehumidify the interior air. Of course, adding mechanical ventilation only makes the situation worse. The solution to this problem is not an ERV. The solution is a stand-alone dehumidifier. Many people assume that HRVs make more sense than ERVs in cold climates. However, the situation isn’t that simple. The behavior of the occupants. At one extreme would be a large, leaky, Victorian house occupied by two elderly people who rarely cook and have few houseplants. At the opposite extreme would be a small, tight home occupied by a six-person family that eats home-cooked meals and takes frequent showers. Is the house dry or damp? But even if we narrow our focus to new homes with tight envelopes, we find that winter humidity levels vary widely. Big homes with few occupants tend to be dry during the winter. Small homes with many occupants tend to be humid during the winter. These two types of homes may need different ventilation systems (or may need to be ventilated at different rates). It’s possible to overthink the choice between an HRV and an ERV. After all, there are other ways to address humidity problems in houses. In fact, these other factors tend to overwhelm performance differences between HRVs and ERVs. For example, regardless of the type of ventilation equipment in your home, you can adjust your interior relative humidity during the winter by adjusting your ventilation rate. If your house is too humid — usually indicated by the presence of condensation or frost on your windows — just increase the ventilation rate. In other words, run your fan for more hours per day. If you live in a hot, humid climate, and you’re worried about high indoor humidity during the summer, reduce your ventilation rate. (Building scientist Joseph Lstiburek has made the somewhat controversial recommendation that homeowners in hot, humid climates should ventilate at a lower rate than the level recommended by ASHRAE 62.2). Finally, if your indoor relative humidity is too high during the summer, you probably need a dehumidifier. Ventilation won’t solve this problem. For a small, tight house in a cold climate — especially a house with a large family — choose an HRV. For a large house in a cold climate — especially a house with few occupants — choose an ERV. In a hot, humid, climate, an ERV will cost a little less to operate during the summer than an HRV. In fact, the difference in performance between these two types of appliances is so slight that many builders ignore climate, house size, and occupancy, and instead make their choice based on energy efficiency. If energy efficiency is your most important criterion — and I believe it should be — choose either the UltimateAir RecoupAerator 200DX ERV (which draws 40 watts to deliver 70 cfm, or 1.75 cfm/watt) or the Venmar EKO 1.5 HRV (which draws 24 watts to deliver 49 cfm, or 2.04 cfm/watt). Remember, stupid installation details will undermine the efficiency of even the best equipment. 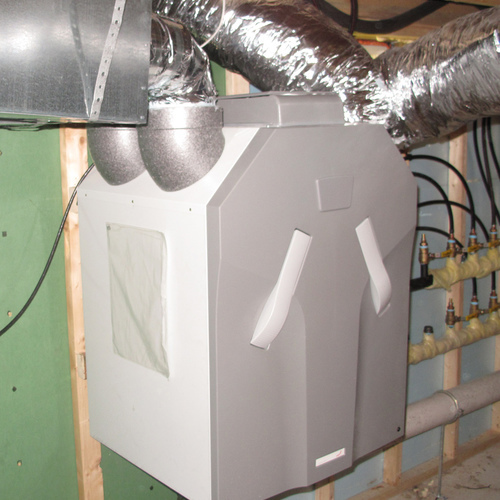 It makes little sense to install a high-efficiency HRV or ERV by connecting it to the plenums of a furnace with an inefficient blower motor. If your furnace blower comes on every time your HRV operates, then the efficiency of the HRV motor is irrelevant. That’s why anyone who goes to the expense of purchasing an HRV or ERV should insist on an installation with dedicated ventilation ductwork — not an installation that tries to use existing furnace ductwork. Finally, it’s worth mentioning that it’s possible to have a well-ventilated home without an HRV or an ERV. It’s much cheaper to install a central-fan-integrated supply ventilation system controlled by a FanCycler. If you choose this route, be sure that your furnace has an energy-efficient ECM blower. The North American HRVs seem to favour cross-flow heat exchangers rather than the counterflow heat exchangers which are more common in Europe. Why is this ? Thanks for the patient, nuanced discussion. I wanted to make the case for simplifying. All the HRV's I've tested have shockingly low flow rates where it counts, and categorically low flow rates overall. To make matters worse, I've measured the power draw of the Venmar Eko 1.5 (with ECM) and found it to use twice as much electricity as rated, both at high and low speeds. Both of these problems are symptoms of poor installation. They lead me to ask, what exactly are you getting for this $2000 doodad? For nearly all homes I advocate an exhaust-only strategy. 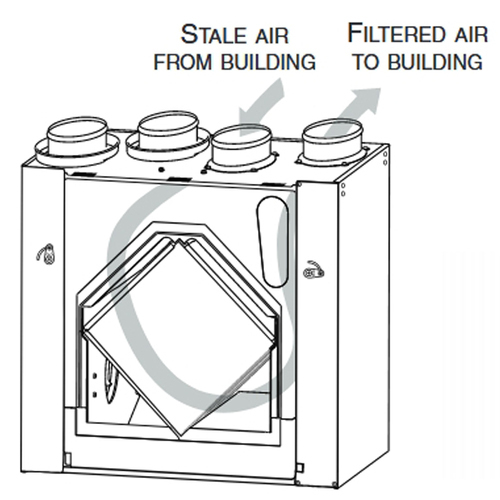 Because exhaust-only ventilation unbalances house pressures, this strategy can result in good distribution of ventilation air when randomly-scattered holes in the envelope leak inward. Exhaust ventilation is usually inexpensive to install, and has a high likelihood of good-enough installation such that 60-80% of rated flow is common. Finally, the motors use about 20% of the electricity of a typical residential HRV, making for low operating costs. 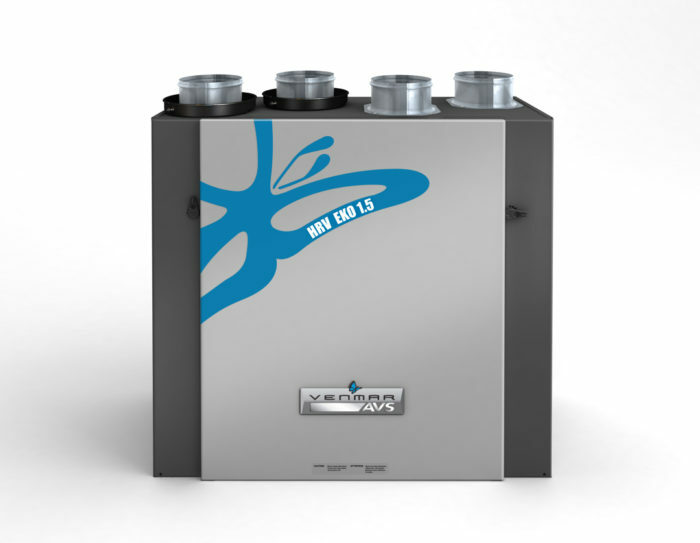 High flow rates, ok distribution, low operating cost: simple is beautiful. I agree that exhaust-only ventilation systems can work well, especially in small homes with simple, open floor plans. Their great strength is their simplicity and low energy use — especially if a Panasonic fan is chosen. The downside to exhaust-only systems is uneven fresh air distribution. Whether this is a problem or not depends on the characteristics of the house where the system is installed. I don't believe that the use of passive air inlets, which are often overwhelmed by the stack effect and wind, solves the problem of uneven fresh air distribution in houses with exhaust-only ventilation systems. Nevertheless, in many homes exhaust-only systems work very well indeed. You haven't really explained what you mean by the examples of "poor installation" that caused the low flow rates in the HRVs you tested. But I can imagine the problems included convoluted duct systems, undersized ducts, or clogged filters. Every ventilation system needs to be well designed, properly installed, and commissioned. Commissioning must include flow rate verification. If the systems were badly designed, poorly installed, and never commissioned, the problem is not the HRV. However, the examples you cite are arguments in favor of simplicity. I worry about where you're sucking the air thru, esp. on a tight house. Why not just install some inlets if you want to avoid an ERV? Great piece, Martin. This sentence confused me a little: "If the house has an ERV, some of the moisture from the incoming outdoor air is transferred to the dryer exhaust air." Are you referring to the clothes dryer exhaust air or the drier exhaust air in the house? On this point "In Houston, a tight, well insulated house is more likely to have problems with high indoor humidity than an older leaky house. ", it seems to me that it depends on the season. A tight house is less likely to have high indoor RH in the summer as the outdoor moisture won't work its way in through infiltration. I agree with Joe L's point that 62.2 can be excessive. It seems to me that the standard was developed for worst case situations. If the house is well built, has minimal pollutants and toxins in construction materials, the occupants don't use nasty smelling cleaners and personal products, take their shoes off, and don't have pets, 62.2 is very likely overkill. If they smoke, have dogs, and the house is full of VOCs they may need more. Finally, Broan has come out with an interesting new system (smart sense) that coordinates all the bath fans and the kitchen vent hood with an intake damper and turns fans on and off automatically to provide a set amount of ventilation. The switches communicate with each other and the damper control through the house wiring to manage the total ventilation CFM, making sure that it reaches the desired minimum. Looks good at first glance, I'd be interested in your take on it. 1. The intended meaning of the phrase, "the dryer exhaust air" was "the exhaust air, which happens to be more dry." Because my phrasing was confusing, I have corrected the text above. Thanks for pointing out the confusion. "For several years, Pulte Homes has been building new houses in Houston with a package of energy-efficiency features developed by the Building America program. Before Pulte’s involvement with Building America, their Houston homes had no noteworthy problems with high indoor humidity. But to the surprise of Building America consultants, Pulte’s first generation of Building America homes in Houston had unacceptably high levels of indoor humidity. "To probe the origins of the humidity problem and to develop solutions, Building America sponsored a study examining dehumidification options for production builders in hot, humid climates like Houston’s. The study, directed by Armin Rudd, principal engineer at the Building Science Corporation, compared equipment designed to lower indoor humidity in 20 Pulte homes in Houston. Rudd presented his findings on October 10, 2002 at the Energy and Environmental Building Association (EEBA) conference in Phoenix, Arizona. "Rudd’s data convinced him that the humidity problems in the Houston Building America houses were not due to the increased ventilation rate, but were an indirect result of the improvements in window performance and envelope tightness. These improvements lowered the buildings’ sensible cooling loads to the point that existing air conditioners are unable to handle the latent load. The research confirmed that in these houses, the only way to keep the indoor relative humidity dependably below 60% is to install a dehumidifier." "The fans come with controls that are able to communicate with other fans in the home, keep track of the minutes of manual operation of all the home’s exhaust fans, calculate the amount of additional ventilation required each hour to meet ASHRAE 62.2 requirements, and automatically operate all of the home’s fans when necessary to meet ASHRAE 62.2 minimum ventilation rates. Moreover, the fans are quiet and energy-efficient. "The fans are designed to be installed in homes requiring two or more exhaust fans. Each fan includes an integral control module. Using a table that comes with the installation instructions, the installer programs one fan -- the mas-ter unit -- with the desired ventilation rate for the entire home, according to the ASHRAE 62.2 formula; the factory default rate is 90 cfm. "Like most bathroom exhaust fans, Broan SmartSense fans can be operated with a manual wall switch. Once each hour, the SmartSense control calculates the total manual run time of each fan during the previous hour. (The fans communicate with each other over the home’s power lines; no communication wiring is required.) Before initiating a cycle of automatic ventilation, the SmartSense control gives credit for any operation time resulting from use of the manual wall switches. Automatic ventilation run times are distributed evenly among all the fans in the house. If manual fan operation during the previous hour exceeds ASHRAE 62.2 requirements, no additional automatic ventilation occurs. "For example, assume that a house has a four-fan system and an ASHRAE 62.2 ventilation requirement of 60 cfm (3,600 cubic feet per hour). The ventilation rate is programmed into the control when the system is commissioned. If none of the fans has been operated manually for a full hour, then the control will direct each of the fans to operate long enough to exhaust 900 cubic feet (one fourth of the ASHRAE 62.2 requirement). Ventilating from four fans provides a better distribution of fresh air than ventilating from a single fan. "The control can be set to “vacation mode,” suspending all automatic ventilation until the next time the master fan is manually operated, at which point automatic ventilation resumes." Just to be clear: tight houses are always more energy efficient than leaky houses, even in Houston. I strongly believe that houses should be built as tight as possible. Although I pointed out that tight houses in Houston often have high levels of indoor humidity, there's a simple solution to the problem: install a stand-alone dehumidifier. If you do that, your tight Houston home will be a low-energy home — and a dry one. I must take issue with Li LIng Young's stance on exhaust only systems; "For nearly all homes I advocate an exhaust-only strategy... Simple is beautiful" I understand that he clarified his advocacy of this type of ventilation strategy with "for nearly" but comments like these (intentionally or not) scare builders out of tight home construction. They begin to think, "this ventilation stuff is too complicated" and its back to business as usual- building leaky, inefficient homes. Or perhaps the builder decides to build a tight home, and puts serious effort into air sealing and tight construction. But because of his perception home ventilation, his ventilation strategy remains the same; exhaust only. Perhaps this strategy consists of 4 bathroom fans. But what about the other exhausting appliances in the home... clothes drier, 300 cfm range hood, and atmospheric-venting water heater... and why not throw in a wood-burning fireplace? This really isn't all that atypical. Doesn't anyone see a problem in this? Thanks Martin for a great article and for references to Houston's climate. Good article, but some corrections are necessary. You said twice that, with an ERV, no mixing of the two air streams occurs. While it's hard to find manufacturer's specs on cross-contamination, ASHRAE Standard 62-2004 allows 5%-10% ERV cross leakage (depending on whether it's exhausting from the kitchen or just bathrooms). I suspect there is some leakage in every unit. You said that "people have lived healthy lives for thousands of years in climates where the relative humidity is often below 20%, so it’s not at all clear that low humidity levels are unhealthy." Sure, but they evolved in those climates and didn't have expensive hardwood flooring or overly-sensitive mucous membranes. Low humidity not only causes wooden furniture to loosen up, but can cause respiratory problems and irritation of nose, throat and skin. Houses like RH between 20% and 40%, while humans like RH between 30% and 70%. So the appropriate indoor compromise is 30%-70% RH (at the low end in winter). You say that "freeze-up problems were solved years ago by the development of controls with a defrost cycle." But that solution can involve an energy-intensive electric resistance defroster or dampers which recirculate indoor air, thereby bypassing the fresh air function. Those dampers are also likely to increase cross-contamination when they're closed. You claim that " if we narrow our focus to new homes with tight envelopes...big homes with few occupants tend to be dry during the winter." I would like to see evidence of that. A big empty heated house might be dry, but almost any occupant load in a tight house (unless it's an enormous house) will drive moisture levels upwards. A big house with the same level of tightness has much smaller ACH because of the larger volume, and it's winter air exchange which dries out a house. Don Fugler's commnet that “In a new, energy-efficient house with no major moisture sources in a very cold climate — a prairie climate — the code-required level of ventilation will dry out your house way too much” is largely irrelevant to the rest of us. Everywhere in the US, typical winter RH levels are higher (12% avg.) than in the summer (though absolute humidity is lower). with Brett Moyer's comment about the elegant simplicity and high functionality of an exhaust-only system. Brett said, "comments like these (intentionally or not) scare builders out of tight home construction." On the contrary, if builders understood that they could build tight homes without the added expense of a centrally-ducted heat-recovery ventilation system, they would be more likely to concentrate on envelope improvements. And I'm right with Li Ling Young's advocacy of simple and functional exhaust-only ventilation. More complex technology invariably creates more potential failure modes and requires more maintenance for reliable operation, often underperforming from ratings or expectations. There are many ways to mess up the design and installation of a central ventilation system. Martin continues to base his concern about passive make-up air inlets on one flawed study which demonstrated stack effect exfiltration from inlets in leaky homes. In a reasonably tight home, passive fresh air inlets combined with efficient bath exhaust fans work beautifully. That's the only system I've ever used. We just finished a tight house (0.6 nach) with no AC (solar assisted radiant floor heat only) and our testing trade contractor told us we would be wasting our money if we went with an ERV over an HRV. Their thinking was that without AC we would see no dehumidification benefit in the cooling season. I agree with this but I was more concerned with moderating humidity levels during the winter. The cost was negligible between the two and I felt like this was cheap insurance as I think homes this tight have a lot of unknowns as far as how they will behave with respect to humidity etc. I'd like to get others input on my thought that an ERV may help moderate humidity levels during the heating season. BTW we are in northwestern NC at an elevation of about 4,000 feet with 5480 HDD and 1033 CDD. Thanks for your comments. Since you apparently agree with me on many points, I'm not sure why your comments refer to "errata." 1. ASHRAE 62.2 is a ventilation standard. The standard's maximum limits to air-stream cross-contamination are not measurements of actual cross-contamination. Any HRV or ERV manufacturers care to chime in with actual measurements? 2. You appear to agree with me about the health of people living in low-humidity climates. No argument there. 3. I never claimed that low indoor humidity was good for wooden furniture, so again, we are in agreement. 4. The defrost cycles with which I am familiar do not use electric resistance heat. They involve shutting down the ventilation function for a certain number of minutes to allow recirculation of indoor air through the core to raise the temperature of the core before resuming ventilation. Again, since I never described the mechanism of the defrost function, this fact is something we agree on and does not represent an error. 5. Although you assume that the experience of residents of Alberta and Saskatchewan is irrelevant, I always write with Canadian as well as U.S. readers in mind. Although the information I provided may not apply to your climate, it is still of interest to some readers. Obviously, the information I provided on Houston conditions similarly does not apply to you -- but it is of interest to Texans. 6. My article attempts to provide guidance to those trying to decide between an HRV and an ERV. I never derided exhaust-only ventilation systems or central-fan-integrated supply ventilation systems. For many homes, these two other ventilation methods are entirely appropriate and in fact preferred. On that fact I agree with you. 7. This is not the first time you have disagreed with my observation that wind and the stack effect often overwhelm passive air inlets, undermining their utility. It seems we have a clear disagreement on this one issue. Since we have debated it in the past, there's no need to reopen the issue here. Passivhaus mentions bypassing the HRV during "night flushing". There are times when conditions outside are "better" than inside. Precooling or preheating or "drying" with increased volume of outside air makes sense sometimes. Are there mechanical systems that allow for bypass and high volume air change? Do any HRV's take advantage by switching between warm and cool intakes? Apparent differences in microclimates on the sunny and shady sides of the house cannot be used to good effect for cooling. That's because the air temperature is the same on both sides of the house. As soon as you start sucking in outdoor air, you're basically mixing the air near the wall and pulling air from a large volume. If you are drawing 80 cfm of ventilation air, that's 4,800 cubic feet per hour. You're not just pulling the "shaded air" right near your siding — your pulling in outdoor air from the great outdoors. That's why there are no energy savings that accrue from placing the outdoor unit of your air conditioner in the shade compared to placing the unit in the sun. If you have a very tight house (I'm assuming you meant 0.6ACH50, not ACHn), the ERV will lead to higher indoor relative humidity (RH) levels during the heating season when compared to an HRV or an exhaust-only system. In the heating season, your indoor air generally has a much higher moisture content than the outdoor air. The ERV will recover some of this moisture, leading to higher RH levels (when compared to an HRV or exhaust-only system). The cross contamination in the Ultimate Air 200DX is about 4%. Some ERVs and HRVs have an "economizer" function that allows heat recovery to be bypassed when outdoor conditions are favorable. I use the Ultimate Air 200DX in my house. It has an economizer that, when activated, turns off the energy recovery wheel when the outdoor air is in the range of 55-70F. Thanks for the cross-contamination information on the RecoupAerator. John, where did you get the 4%? The Home Ventilating Institute (hvi.org) has a certified products directory that lists the exhaust air transfer ratio (cross leakage) for each of its certified products. For the Ultimate Air Recoupaerator this ratio is .096, or 9.6%. Am I interpreting this incorrectly? This is a great conversation happening here. I hope no one minds if I write a little... yes, we manufacture the RecoupAerator... I am a primary design engineer responsible for the RecoupAerator..... but I do try to stay neutral on facts. Cross leakage has been a passion (thorn) for me for the last 3 years or more. Mr. Brach is correct.. HVI lists our unit at 9.6%. I was at Bodycote (testing facility in Canada) for three weeks while they were doing all of the performance testing (including cross leak). The 9.6% was a number that was not repeatable... same day, time, test... the numbers were not consistant, so we settled with them on that number. I believe that the cross leak will vary depending on flow and duct pressures, anywhere from 2-10%... so i cannot tell you a firm number. The next question is.. does it matter? My opinion is... well, no. Reasons: First, most competitors will start recycling leaving stale air, back into incoming fresh air for defrost. This is 'cross leak'... and a lot! Second, I've never had major complaint concerning odors from leaving air getting back into incoming air.. Third... If you live in a house without mechanical ventilation, you re-breath the same air "all the time"... and I haven't heard of terrible results thereof... So, i'm just not sure there is a horrible consequence from cross leak. Further, the performance testing has penalized us for the leak... Meaning: our performance would be even higher without the leak. I had our unit testing in the EU, with some effort spent to limit the cross leak.. and with less cross leak, we had apparent sensibles of 98%+, because less air is leaking past the heat exchange medium when you have increased cross leak. OK.. enough on that one for now. The Venmar Eco... i've looked at this unit a few times... bravo for the EC motors (finally)... we've been using them since 1999... and the defrost is 28% recirc at 23 F, and 45% recirc below -17 F.
The recoupAerator: our theory is that you wanted fresh air all the time.. or at least when you choose... in which case below 12 F, we need active defrost of some fashion. Basically, we have a pulse modulated duct heater... keeping air coming to the unit at 12 F if it is below.. or we have a water coil, which you can do a ground loop.. 50 F water... or what not... for defrost. When its cold outside.. there is a penalty.. no getting around it. Some recylce inside air.. some warm up the incoming air.. Both take energy, or a loss of fresh air. The only way around it is to move to a warmer climate. OK.. i'm out of time right now.. Humidity and HRV vs ERV... my goodness.. i'll have to dedicate another novel to that discussion.. but later..
Of course, if this topic interests our readers, I hope further comments to be made here at the GBA site so GBA readers can benefit from the discussion. Thanks for your reply. Yes we are at 0.6 ACHn. It appears as if we made the right decision on the ERV over HRV. We are building a new house just north of Dawson Creek, BC. as we are building a tight, well insulated building we are considering installing a Venmar HRV 2600 to deal with indoor air quality issues. I was wondering if anyone is familiar with this unit? As it gets down to minus 40 during the winter is there any possibility of the unit freezing up. I couldn't find any info on their website indicating whether there is a deicing feature. The unit would be in a heated, utility room located in the center of the lower portion of the house. So it would only be subjected to extreme cold air through the fresh air intake of approx ten feet. Also does anyone know how noisy the unit is? Different question... regarding thermostats. We are installing baseboard heat and i am considering electronic proportional control thermostats. Do you have any info on them including: make, models and operation? The Venmar 2600 has an "Auto" operation mode that senses the outdoor temperature. When the outdoor temperature is too low, it prevents air exchange to protect the core from freezing or icing up. For more information on this feature, contact a technical representative at Venmar. You might want to speak to John Pothier ( pothierj [at] venmar.qc.ca ) or just call 800-567-3855.
upgraded wall insulation has made this old house much tighter !! summer as basically an air exchanger without removing heat or humidity. say HRV, but then when i did my own internet research about 1/2 say ERV ? find any ERV kits mainly because they say they must be balanced etc. use comfortably all year round. doing a simplified return to return install. Or should i mail order an ERV online and try installing it myself. Many of your questions are answered in this blog, so I suggest you re-read it. To minimize the negative effects of introducing hot humid air into your house during the summer, be careful that you don't overventilate during the summer months. Reduce the ventilation rate and see if your house is still comfortable. You are correct to worry about raising the indoor humidity by overventilating. Either an ERV or an HRV will work for you. I think you are making a big mistake to use ductwork designed for your forced-air heating system as ventilation ductwork. Your ventilation system will perform better with dedicated ventilation ductwork. Interesting article you wrote. However, I think I have a situation not covered by it. What do you recommend for a hot and dry climate (4,000 ft. elevation) such as that found in south-central New Mexico's Mesilla Valley? An ERV or an HRV? The house will also be a farily tight one. My advice to you can be found in the article: "The difference in performance between these two types of appliances is so slight that many builders ... make their choice based on energy efficiency. If energy efficiency is your most important criterion — and I believe it should be —choose either the UltimateAir RecoupAerator 200DX ERV (which draws 40 watts to deliver 70 cfm) or the Venmar EKO 1.5 HRV (which draws 13.5 watts to deliver 40 to 80 cfm)." Thanks Martin, guess I should have realized that's what you were going to say. 2,800 sf double-walled (partially vaulted) house with triple glazed windows in Western Massachusetts - Climate zone 5 - HDD = 7928 with two (plus occasional guest) occupants. Warmboard radiant floor system. A Renuwaire EV300 is specified to run at 60% per hour to provide 8 air changes per day (.35 air changes per hour) based on ASHRE 62-1999. 6" oval ducting will run up to 85 cfm for all exhaust points with 8" trunk and adjustable volume dampers at merger points. My question has to do with the ERV and bathrooms/laundry rooms and kitchen exhaust locations. Would it be preferable to install separate exhaust (only) fans in these locations? One bath has a walk-in shower with no enclosure. There will be an exhaust fan over a commercial range. I'm concerned with the low cfm of the ERV and these specific spot locations. Your ERV should be perfectly adequate to handle the moisture in your other locations (bathrooms and laundry rooms). Most ERVs can be operated at high speed with a booster switch located in bathrooms; this allows you to increase the exhaust air flow when desired for odor removal or moisture removal. If you have further questions about your RenewAire ERV, call the tech help line at RenewAire at 800-627-4499 or 608-221-4499. Thanks, Martin for the response. The RenewAire ERV is a single speed unit, operated on a percent of hour run time with 20-40-60 minute timers at each exhaust point to insure planned airflow from each location when needed for spot ventilation needs. My concern is with 80 cfm in a master bath with an open shower and this type of unit. I spoke to tech support at RenewAire, who are extremely helpful. All bathrooms will be handled by the ERV. In addition a single spot exhaust on a timer will be placed directly over the open shower area. Your article and the ensuing discussion have been very informative to me, for a variety of reasons. My wife and I are currently in the design phase of our retirement home and, based upon the information and opinions expressed in this thread, I think I am now prepared to finalize some major design considerations regarding HVAC. We will be living in a relatively hot-humid climate and, as you know (as well as many of the contributors to this thread) the economics of weather tight construction with affordable “cooling” is a delicate balance in my location. I would value input on my current design elements. First, some design background. We have made a decision to use off-grid PV power generation and solar heated water. This decision was driven by several factors: The site is remote and we had to deal with the cost to install U/G power from the grid, about $20K; the current tax credits help with the cost, and; we have accepted the fact that PV power is a life style change. Also, we propose to use propane for cooking and back-up water heating. Our house will be located about 35 miles SW (as the crow flies) of downtown Atlanta, Ga. which puts me slightly on the north side of Zone 3. We anticipate this to be our “last” house, thus the design will incorporate amenities and spatial considerations for when we get really old. The “heated/cooled” area is about 2,300 sf above a 1,680 sf (unheated) basement that is fully underground with the only openings to be for two vehicles. We anticipate all PV equipment (batteries, inverter, etc.) and mechanical equipment to be located in the basement. Our short-term goals are to construct a PV powered house as economically as possible with a long-term goal aimed at simple and low maintenance operation. I have spent several months researching and studying a HVAC design that would incorporate earth tubes. I was (and still remain) intrigued with the simplicity of the concept, that is, pre-cooled or pre-heated outside supply air from an unending source. I was always concerned about the mold issues, but believed it could be overcome with a design that facilitated access to the piping for cleaning and disinfecting, as may be required. I am impressed with the web site http://www.earthairtubes.com/ that advocates a design that deals with the mold issues by a full under-drain system that captures and wicks the condensation away from the pipes. Apparently this design has been installed several times and thus, offers empirical knowledge. This was much more “real-life” information that I have been able to find on the subject, anywhere. When I made a rough cost estimate for me to install a similar system at my location, my decision was made not to proceed with the earth tubes. Although my estimate of $6.5K may be high, I reconciled that the earth tube system did not offer any financial advantages, and given the uncertainties in the air quality issues, engineering snafus, and potential maintenance issues, I focused on other systems to meet the heating/cooling needs for my house. In addition to this one, I’ve read most of your articles (and accompanying threads and links) in GreenBuildingAdvisor, including on “Hot Climate Design”, “Heating a Tight, Well-Insulated House”, “Choosing Triple Glazed Windows”, “Using Ceiling Fans to Keep Cool Without AC”, as well as, many of the other contributors. The collected information provided in GreenBuildingAdvisor, tons of research, other web resources, and reviews of the various manufacturers, has led me to a conceptive HVAC design. The design consists of: Mini-splits for both heating and cooling, de-humidifier, and an ERV ventilating system. Because a heat/cooling load has not been calculated for the house, I know equipment selections can not be finalized at this point. But hopefully equipment model selection will just be fine tuning and some equipment (such as ERV’s and de-humidifier) can be determined with the info currently available. Even if this overall design concept seems like a reasonable approach to solve my cooling needs, the devil could be in the detail. •	The mini-splits I’ve researched are mostly 208/220V systems that consume lots of amps. Are there any manufacturers offering any low energy models? •	Is the wall mounted vs. ducted unit (hidden in wall) an aesthetic or a functional issue? •	Would the above installation be an acceptable part of the HVAC design in my house that uses mini-splits and an ERV? •	Should the ERV and de-humidifier be separate duct systems? •	I’ve reviewed the UltimateAir ERV technical and it seems to be a very good system for my application. I like the options and the way they interface into the control unit. I especially like the EconCool, the heating coil options. If the option performs as stated, would the EconCool be a useful option for my application? •	Maybe I missed it on the UltimateAir website, but one aspect of the heating coil I did not see were controls and pumps for the water circulation. Do you know if UltimateAir has any info on that? •	If the final installation price is reasonable, would it make sense to install the heating coil even with the split-mini’s. •	Although the max 8K btu’s is not much, could it suffice for most of the heating days in my house? •	Are there any other manufacturers that have the heating coil option? •	What are some other energy design/construction be considered. •	What are your thoughts on wall and roof R-values with this proposed system? •	Would a propane tankless water heater be an effective booster for the solar heated water and used with the heating coil in the ERV? As someone who has lived off-grid for 35 years, and who has advised several people on off-grid equipment choices, I think you are making several fundamental errors. 1. There are only two heating systems I would recommend for off-grid homes: wood stoves and propane space heaters (sealed combustion units with through-wall venting) that do not require electricity. All other equipment uses far too much electrical power to consider. 2. Using PV for air conditioning is an option only for millionaires. Air conditioners and ductless minisplits use far too much power for an off-grid system. Use ceiling fans and put a few ice cubes in your lemonade. 4. Tankless (instantaneous) water heaters work fine as a booster for a solar hot water system. That's what I have in my house. However, if I were to do it again, I'd stick with a simple tank-style propane heater, which costs less and is more dependable. Good luck. You have to stop thinking like a grid-connected person. You will have far less electricity if you live off-grid than you are used to. In winter, when your heating needs are highest, your electricity production will be very low. Well, It's gonna be real hard to give up the AC (mini-splits or whatever), but over the last few years as off-grid reality sank-in, I've become accustom to the change in mind-set. I ain't no millionaire, but if I were to find just a little PV investment cash for some mechanical cooling, what would you recommend as the best-bang-for-the-buck. Instead of spending $100,000 on enough PV panels and a huge battery system to air-condition your house, you could use the $100,000 to buy another piece of land -- one that is on the utility grid. Have you considered a geothermal heat pump? The efficiencies are much higher than the options you've suggested, and with a larger lot the PEX lines are inexpensive to bury horizontally. There is no way that an off-grid PV system can power a ground-source heat pump. In winter, when you need heating, a PV system in a northern climate just isn't producing much electricity. Nobody who lives off-grid chooses electricity for their heating system. I measured my Venmar Eko 1.5 on low speed at 22 watts. Still fantastic even if not as low as advertised. Note that these EC motors are noisier. I bought a (<$100) silencer from EFI for the supply which totally solved the problem. some installations get it on exhaust also, but I don't mind the noise in the bathroom. I think ducted ventilation is the price of living in a box: you need air where you live. I have measured air flows at trickle vents and the direction of flow depended on the wind direction. We don't build tight enough to make these work. Look at the blower door curve for the house and see how much pressure the Panasonic or whatever exhaust fan's flow will exert on house pressure. It is VERY little -- much lower than low speed wind. So the wind direction overwhelms the exhaust fan system. You also don't know from what basement crack your outdoor air is coming from -- rather get it straight from outdoors to breathing area. Can you help to provide any comments? You are in the eastern region of what country -- the U.S.? It's very difficult to power the electrical appliances you are talking about -- heat pumps, ERVs, etc -- in an off-grid building. If you are talking about an off-grid building with a PV array, it's certainly impossible to heat it with a heat pump -- because there won't be much sun during the cold months. Of course, if you have a large wind turbine in a very windy location, or a dependable source of hydroelectricity, that changes everything. Yes, I am in eastern region of USA. I completely agree to what you have mentioned but, it still is part of our test to design house ONLY powered by solar and to run all calculations based in that. May be, they check our design capability rather than practical feasibility of it in the market. So sorry if that confuse you but I am glad to read your article as it helped me to proceed further on my research. Thanks again for your swift response!! We want to add ERV system. However, the house was built and already has HVAC duct. After we did some research, we find now we can do separate return air from the bath room and fresh air goes to supply dect of HVAC. However, our contractor told us he will exhaust stale air from return duct and put a new duct for separate fresh air to the living room cutting a grill on the floor. Which way is better? thanks! The best way to duct an HRV or an ERV is always to use dedicated ventilation ductwork, separate from the forced-air ductwork. Ideally the exhaust air is pulled from the bathrooms or laundry room and the fresh air is supplied to your bedrooms and living room. Any other ducting method is inferior. Be sure you understand which fan is being used to distribute your ventilation air. If the contractor expects you to run your furnace fan every time you need to ventilate, just to distribute your ventilation air, you will be using a tremendous amount of electricity compared to using the ERV fan and dedicated ductwork. thanks! Martin. Now there are two contracts proposal, both are partially dedicated: one is separate, additional ductwork to be used to transfer stale air from the kitchen area to the ERV while the fresh air is ducted with HVAC return air. The other is in opposite. A separate, additional ductwork will be ducted directly to a new fresh air grill in the living room while the stale air will be connected to the HVAC return duct. Both are partially dedicated ventilation. One is stale air using separate ductwork, the other is fresh air using separate ductwork, which way is most efficient? Please help! How do these contractors propose to wire the fan controls? Will either proposal depend on the furnace fan to distribute ventilation air? Or do your contractors think that the ERV fan can be used? If they depend on the ERV fan, how will they commission the system to be sure that the correct airflow (CFM) is reaching each room with ducted fresh air, and to be sure that the correct airflow is being pulled out of each room than is being exhausted? After all, they can't use a damper on each duct to adjust airflow if they are using heating/cooling ducts. Thanks for your information. When we shop for ERV, we find some only have one continuous mode and some have two mode: intermittent and continuous. Could you give us some explanation about these two mode and tell me which ERV having only one continuous mode or having two modes is better for operation and energy efficiency? You should probably direct your questions to the ERV manufacturers. Every manufacturer has a tech help hotline to answer questions. Different ERVs come with different control options. If the ERV lacks a control for intermittent operation, I see no reason why it shouldn't be possible to use an external control -- basically, a timer or a humidistat -- to control the operation of the ERV. Every ERV needs to be commissioned so that its ventilation rate is confirmed. If you want 40 cfm of ventilation, you don't want an ERV to ventilate at 60 cfm. If there is no way to dial down the ventilation rate, intermittent operation will give you the ventilation rate you need. For example, if a 60-cfm ERV is operated for 40 minutes out of every hour, the ventilation rate is 40 cfm. All of these control options should be clearly understood by the ERV manufacturers. You can go online and read their installation manuals, all of which contain instructions for commissioning and operation. If the fresh air does not go into HVAC, do you think we lose some energy efficiency in Winter since the fresh air temperature from ERV could be lower than the supply air? Eg, the temperate of fresh air from ERV coming in the house is 40F, however, the temperate of the supply air is 70F, then fresh heated air needs to go into return duct work to heat again to 70F or it will mixed with the supply air, if so, it will drop down the room temperate a little bit? No, there shouldn't be any energy penalty due to the fact that fresh outdoor air needs to be heated. The air needs to be heated no matter where it is introduced -- whether it is introduced through a grille in your bedroom at the end of a dedicated ventilation duct, or whether it is introduced into your furnace ductwork. Either way, it's still 40 degree air. However, there is a major energy penalty you don't mention: the penalty that arises from using an inefficient furnace fan to distribute ventilation air instead of an efficient ERV fan. Furnace fans often move 900 to 1200 cfm; a ventilation fan may only move 80 cfm. Running a furnace fan to distribute ventilation air wastes a lot of electrical energy during the swing seasons -- spring and fall, when your furnace fan would ordinarily be idle. We are building a 3500 sq ft house near Palo Alto, California, which has mild dry sunny summers, but in winter gets into the low 30s F with spotty to heavy rain. For A/C, which is only needed a few weeks in the year, we are specifying Fujitsu ASU9RLS mini-split units, 26 SEER. For heating, we are installing hydronic radiant floor heat with solar and gas sources. We tend to get indoor dryness in the winter heating season. Question: Will an ERV help keep the indoor humidity at higher, more comfortable levels? Right now we have specified an HRV (Broan HRV90HT), but a Broan tech support rep told us the HRV would dry the house out. We tend to keep windows cracked open year round, but on the hottest or coldest days we plan to close the windows and turn on the HRV or ERV. By the way, does anyone know if the Broan HRV90HT has any noise or other issues? Considering your climate, I can't imagine that you'll have problems with indoor dryness, no matter which method of ventilation you use, as long as your envelope is relatively airtight. Homes that have very dry indoor air during the winter either (1) are located in a very cold climate, or (2) have very leaky envelopes. If you are building a new home, do your best to reduce air leakage, and you'll be fine. During the winter, the supply air from an HRV will be somewhat dryer than the supply air from an ERV, so choose an ERV if you're worried. But I don't think an HRV will cause any problems at all in your climate. How large is a large house? And is that only conditioned living area, or overall volume? The house we're planning is just under 2100sf heated (hydronic baseboard is looking like the winner but I haven't ruled out mini-split ductless) living space with about 1400sf unheated basement about 1/2 of which may someday get finished. The house will be a vacation home for the next 10-15 years. That means when occupied it will have 2-6 people on average however it will probably only be occupied 30-45 days of the year at the outset. So is this a small house or a large one with respect to deciding between an HRV or an ERV? There's a bit of cost difference between these units so I'd like to make the right choice. I would call your house average in size (for the U.S.), neither big nor small. Don't sweat the decision. Buy an HRV or an ERV -- whatever you want. Either one will work fine. As I wrote in the blog, the energy consumption of the appliance (and its efficiency) matter more than whether it is an ERV or HRV. Martin, my 2.14 ach50 house is ventilated with a venmar HRV set on low. My RH is currently 45-55. The bedrooms seem to have a higher RH at 50-55. The temp here in winter Seattle is typically 40 with the RH at 90+. If you want to lower your indoor relative humidity during warm humid weather, your best bet is a stand-alone dehumidifier. We are getting ready to tighten-up a roughly 6000 sqft home here near Raleigh NC, sealing and insulating the crawl space and open-cell spray-foaming the roof deck and gable ends in the attic. Two things: 1) I don't see any conclusive recommendations of one over the other (HRV/ERV) for this mixed humid climate; 2) do you feel a blower door is a critical part of the process of determining the exact ventilation recommendations, or can we be reasonably comfortable, with communication with our HVAC pro, that an RV install will provide sufficient pre-conditioned fresh air? You wrote, "I don't see any conclusive recommendations of one over the other (HRV/ERV) for this mixed humid climate." I agree. That's why I wrote, "The difference in performance between these two types of appliances is so slight that many builders ignore climate, house size, and occupancy, and instead make their choice based on energy efficiency." Q. "Do you feel a blower door is a critical part of the process of determining the exact ventilation recommendations?" A. No. The most important step is to follow ASHRAE 62.2 recommendations. Neither an HRV nor an ERV provides "pre-conditioned fresh air." Instead, these appliances provide fresh exterior air, with some heat recovery to lower the energy penalty of ventilation and to slightly temper the temperature of the ventilation air. By the way, I don't know what "an RV install" is. 10-4, Martin. Thank you. Owner leaning toward an ERV, so that just might be the kicker, eh? By RV install I meant any recovery ventilator installation. HI Martin, GREAT ARTICLE. I am in need of an ERV/HRV in a mixed climate (central NJ). Are your top recommendations still the UltimateAir and Venmar? Anything new we should know about? I have contacted both companies direclty and price wise both seem to be within $100 of each other. If it helps any, our house is a tightly sealed house, 3600 sq feet colonial, 2 story, 2 systems (one in attic, one in basement). I am leaning towards the ERV only because it seems it might be a little less costly to operate overall...but I am a gadget man and do like the LCD on the Venmar. Your thoughts based on my current situation. Q. "Are your top recommendations still the UltimateAir and Venmar? Anything new we should know about?" A. Yes, I still like the UltimateAir and the Venmar. However, if you can afford to spend more, the Zehnder HRV from Europe is getting great reviews -- it's very quiet and very efficient. Just expect to pay more. Sorry to be so late to the party. Paul ref aux water heater. While a starving student I noticed that I could turn OFF the gas in the water heater and that the PILOT light alone would heat enough in 24 hours for a comfortable shower and dishes. Years later I learned that you could get bacterial growth in such a system and you should occasionally heat it up enough to pasteurize it. Much of conservation depends on trading time for energy. It's possible this detail is in the comments somewhere, but this might be worth adding to your list of manufacturers for small applications--we've ordered one of these Panasonic ERVs for an approx 1200 cf (120sf x 10'h) space. Can be set to 40/20 or 20/10 cfm at installation. Should arrive in the next couple days--we'll see how it goes. Price online has been in the mid $300 range. That’s why anyone who goes to the expense of purchasing an HRV or ERV should insist on an installation with dedicated ventilation ductwork — not an installation that tries to use existing furnace ductwork. Still a little confused on this comment? I understand that using the furnace blower to distribute the incoming air from a HRV would be unwise. But why cant the duct work be used in a passive manner and have the HRV blower push the air through it. I understand that a direct return to the living and bedrooms would better circulate the air in the house. But would not the existing duct work be almost has good at distribution of the ventilation air. In a separate discussion on ventilation it is even mentioned that If you do install an exhaust-only ventilation system, don’t bother installing passive fresh air inlets in the walls. Fresh air will find its way into the home through random cracks. if this is true then a HRV that supplies the return air into the duct system should be more then adequate to meet the ventilation needs and you still get the benefit of some energy recovery with the HRV vs a exhaust only system or is there something I'm missing? Thanks for all your great advice. It's incredible how much you have help me over the years better understand all this. One of the great benefits of an HRV connected to dedicated ventilation ductwork is that good distribution of ventilation air is provided, especially to remote bedrooms. The same cannot be said for an exhaust-only ventilation system. If you hook up an HRV to existing furnace ductwork, the fresh air is much less likely to reach remote bedrooms, because such ductwork is oversized and usually leaky. The fresh air will end up somewhere in the house, but remote bedrooms won't get the air exchange. Thanks Martin for working on Thanksgiving!!! Thanks for the response. Cant believe you took the time to answer on Thanksgiving. I'm remodeling an older home so running a dedicated return duct may be a little difficult but I'll try to find a way to do it. HAPPY THANKSGIVING! you are a great example of what Thanksgiving is all about. Can anyone (Martin?) recommend any HRV installers someplace in the vicinity of Stowe, VT? Memphramagog was recommended to me by one of my contractors but despite having spoken to him several times about hiring him as a design consultant and having him install the HW I've purchased (a Fantech SHR1505R which my consultations with my contacts Efficiency VT indicate should be sufficient for my home's needs) for some reason he just hasn't followed up with me. So I need to find someone else to review the design as well as help me get a handle on controlling the humidity in the interim (more on that below) but I haven't had much luck with online searches. I sort of need to do something about this soon because we've been having some humidity control issues. The house is a SIP over timber frame design. The frame went up in mid August as did the SIP walls. The house was protected from rain intrusion but open to the air for a couple of months since the windows and doors installation didn't get completed until late October. Unfortunately VT had an unusually wet summer and fall. Since late October the house has been very tightly sealed though I haven't had the blower door test done yet to quantify it. Even though the building materials had a couple of months with the house not being sealed they still seem to be putting out a lot of moisture and we've been having condensation problems which have at times been very bad. So I even went so far as to install the HRV unit myself in a temporary manner with the exhaust drawing air out of the house from the basement and the intake air coming in to the house on the upper floors in the hopes that this would pull the most dense and moist air out and thereby lowering the humidity. While at this seems to be doing so with the humidity dropping below 60% at other times it rises up into the mid 70s. The house doesn't have a heating system installed yet. The only heat is from the passive solar component of the design and the operation of the Vermont Bun Baker wood stove (which BTW we like a lot so far) that we had installed at the times we're there working on the house. Unfortunately I can't do a final installation on the HRV because the interior wall framing build out is only about 1/2 way done and none of the finish work on it has even started. However I would like to try to get someone in that has experience with HRV installations in the hope that they might be able to determine if more can be done to control the humidity and, until the house is ready for the final duct installation to also review the plan for that (which I've previously gone over with the rep from Efficiency VT) to try to make sure the intake and exhaust ducts will get installed in suitable locations. I just got off the phone with David Hansen at Memphremagog Heat Exchangers. You can reach him at 802-229-2722. He's the best installer of HRVs in the state, and the only one I would recommend. He says he's already talked with you, and hasn't charged you anything to answer your questions. He says he is available to do work at your house in Stowe whenever you're ready for him. What is the best ventilation system to purify indoor air for Los Angeles? And Might the answer be different for the San Gabriel Valley; Encino/Sherman Oaks compared to the Westside; Santa Monica/Mar Vista? I ask about the two areas because it's 15-20 degrees hotter and extra smoggy in the valley during spring and summer compared to the cooler and "seemingly" less smoggy Westside. Assuming it's as air tight a home as possible with in reason for a 1940/1950 retrofit here in L.A what do you recommend? Also, how does your recommendation handle VOC's, moisture and dryness? Outdoor air can be filtered; if you live in an urban area, filtering your air is probably a good idea. But (as far as I know) there is no magic device to "purify" air that is fouled with car exhaust and industrial pollution. Ultimately, preventing poisoning from these sources is a political problem, and I suggest you become an environmental activist. Question: DUCT HEATER required in cold climate house? Hi there - I'm in the beginning stages of building a super-insulated house near Ottawa, Canada. One of the last details / sub-contracts is for the HRV system. One of the firms providing a quote insists a 1500-2000w duct heater is required. This seems silly given that the house has R50 walls, R80 attic, tripled-glazed fibreglass windows and will be tight at less than 1.0 ACH50. In your climate, an HRV or an ERV needs controls that handle low outdoor temperatures to prevent the heat-exchanger core from icing up and to maintain comfort. Every HRV or ERV that I know of includes such controls. Usually, a temperature sensor will shut down the HRV periodically in cold weather to allow the core to warm up; some manufacturers circulate interior air through the core periodically to keep the core warm. These controls work, and no additional electric resistance heater is needed. In general, the need for mechanical ventilation decreases slightly in very cold weather, because the stack effect increases. Homes generally leak more air in very cold weather than in mild weather. So, don't install the heater -- unless there is an unusual technical reason for continuous mechanical ventilation in your home. I just wanted to correct one very common minor misconception. Jay Hersh wrote "...in the hopes that this would pull the most dense and moist air out and thereby lowering the humidity." Moist air is lighter per volume (less dense), not denser, than dry air -- as pilots, meteorologists and engine tuners will know. However, the temperature of the air affects its density much more than moisture content, so, for example, the stack effect is going to far override any stratification caused by moisture, I'd think. I dont know if anyone will read this so long after the thread. But I am wondering something and the builder isn't helping a whole lot. I just moved into a 2 year old 3000 square foot house in the Sacramento, CA area. As you know, the summers are hot and dry.. and the winters can get chilly (but not that bad). The ventilation system the builder installed has seperate duct system - but it uses the AC blower to move the air. I'm not sure what kind of system it is - but I do know it is a Honeywell. The problem I am experiencing (and it was kind of alluded to in the posts) is that the darn thing runs constantly... probably 12 hours a day and uses a ton of energy. No lie - about half my energy use is from this system. Anyway - question... do you think the system is running too much? Q. "Do you think the system is running too much?" A. Yes. It's almost always a bad idea to use a furnace fan or the air-handler fan of an air-conditioning system to move ventilation air. If you have a Honeywell ERV, it comes with its own fan or fans. If the ventilation contractor installed ventilation ductwork, you shouldn't need to use the fan on your air handler. Perhaps you have ventilation ductwork for the exhaust system but not the supply system. In any case, you can call Honeywell for advice. (Try this number: 800-468-1502.) You may need to install some new ventilation ductwork to separate your ventilation system from your cooling & heating system. Installing an ERV in a windy area, etc. I have a few questions for you. Any thoughts you have would be appreciated! 1) I live on the top of hill (in the midwest), and it is quite windy most of the time. Am I just wasting my time trying to add in any kind of mechanical ventilation? Is wind infiltration going to overpower any kind of mechanical system that I install? I had planned on installing some kind a balanced system, probably an ERV. Would I be better off using a supply system to try to obtain positive pressure? My intuition says, however, that there is no way we are going to overpower the wind effect with positive pressure, so this would not be helpful. Just FYI, we have no choice but to connect it our existing furnace system; installing dedicated ducts for the ventilation system is not a possibility for us right now. I understand your logic why this is not advisable, but due to some complexities of our particular situation, our options are limited. But we normally keep the fan for the furnace system on a lot anyway (my wife has some health problems where moving air is important), so we will not be wasting any energy (at least not any more than we would otherwise) by connecting the ERV to our existing system. 2) The plan is to just install the ERV in a loop on the return side of the furnace system. Is that the best way (assuming, as I said, that we have no choice but to connect it to the existing system)? 3) I REALLY would like the incoming fresh air to be filtered with full HEPA filtration. Ideally, I would like the entire furnace system to have a HEPA filter on it, but my contractor insists that this would increase the static pressure of the system too much. So we are just putting a MERV 13 filter on the furnace system itself. That's OK, as long as we are just filtering the air that is coming from inside the house to begin with. But when we are filtering the air that is coming from the OUTSIDE, which might be full of pollen, smoke, etc., then due to my wife's health issues we want to have full HEPA filtration on it. And I assume that we can put a HEPA filter within the ERV loop without increasing the static pressure too much. But how can this be done? 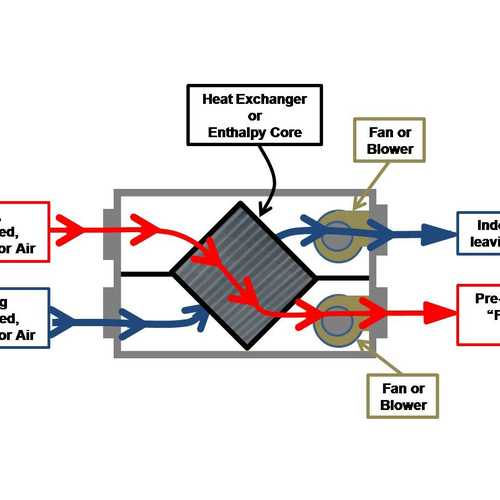 Do you know of any ERVs that incorporate HEPA filters into their design? And if we use one that does not incorporate HEPA filtration into it, and just have a standalone HEPA filter after the air passes through the ERV, how do we assure that we are maintaining a balanced system? 4) Is there a concern about condensation in the ducts in the summer (in the intake duct before the ERV and the exhaust duct after the ERV)? These are just ducts that are open and exposed to hot humid air, so it seems that condensation inside these would be a problem when the ducts enter conditioned space. David, Q. "I live on the top of hill (in the Midwest), and it is quite windy most of the time. Am I just wasting my time trying to add in any kind of mechanical ventilation? Is wind infiltration going to overpower any kind of mechanical system that I install?" A. No, you are not wasting your time. However, if your house experiences high levels of infiltration and exfiltration, to the point where you notice the air leaks, it would make sense for you to hire a contractor to perform blower-door-directed air sealing work. Sealing your envelope will make you more comfortable. If the wind at your house blows from just one direction (primarily), it makes sense for the fresh air intake to be located on the leeward side of your house, not the windward side. Q. "Would I be better off using a supply system to try to obtain positive pressure? My intuition says, however, that there is no way we are going to overpower the wind effect with positive pressure." A. By definition, if one side of your house is under positive pressure due to the wind, then the opposite side of your house is under negative pressure. Air exchange is always balanced. If the wind is forcing air into your house, it is also sucking air out of your house. So your house experiences both positive and negative pressure due to the wind. Q. "The plan is to just install the ERV in a loop on the return side of the furnace system. Is that the best way (assuming, as I said, that we have no choice but to connect it to the existing system)?" A. No. There are many ways to duct an HRV or ERV, as the installation manual from the manufacturer will show you. Some include an exhaust duct; some include one or two supply ducts. Looping to the return air duct isn't particularly sophisticated. If you can find a way to extend an exhaust duct to a bathroom, or to extend a fresh air duct to a bedroom, it's always a good idea. But if you have no choice, you have no choice. The problem with running your furnace fan to distribute your ventilation air is that most furnace fans are energy hogs. I certainly hope that your furnace fan is equipped with an ECM blower -- that is, an energy-efficient blower -- for the sake of your energy bill. Q. "We normally keep the fan for the furnace system on a lot anyway (my wife has some health problems where moving air is important), so we will not be wasting any energy (at least not any more than we would otherwise) by connecting the ERV to our existing system." A. Well, there are actually a lot of ways such a system can waste energy. In addition to the problem of having a furnace with an inefficient fan, there is a potential problem with overventilation. A furnace fan can easily pull more air through the ERV than intended by the ERV manufacturer. Make sure that your installer understands these problems and tests the airflow through the ERV when commissioning the system..
Q. "Do you know of any ERVs that incorporate HEPA filters into their design?" Q. "Is there a concern about condensation in the ducts in the summer (in the intake duct before the ERV and the exhaust duct after the ERV)?" A. I have not heard of any problems with condensation. HRVs and ERVs are designed with condensate drains where necessary. Consult the installation manual for the unit you are considering to see if a condensate drain is required. Exhaust ventilation systems can also contribute to higher heating and cooling costs compared with energy recovery ventilation systems because exhaust systems do not temper or remove moisture from the make-up air before it enters the house. Energy recovery ventilation systems provide a controlled way of ventilating a home while minimizing energy loss. They reduce the costs of heating ventilated air in the winter by transferring heat from the warm inside exhaust air to the fresh outside supply air. In the summer, the inside air cools the warmer supply air to reduce cooling costs. Is ERV needed in central europe climate? I'm trying to spec out a ventilation system for a 2200sqft house in central Europe (Croatia). Summers are humid where I live, and winters are also not dry (50-90%). Is there a need for me to go with a more expensive ERV solution? It's also not just the price, but enthalpy ventilation units (as we call ERV here) are much fewer in numbers, looking at phi certified components. I'm not sure how cold your climate is. Nor do I know how tight your house will be. Here in the U.S., we recommend some type of mechanical ventilation system for all new homes that are built with attention to airtightness. Leaky homes generally don't need a ventilation system. In warm climates, a simple ventilation system (like an exhaust-only system) usually makes more sense than an expensive HRV or ERV. For information on simpler approaches to ventilation, see Designing a Good Ventilation System. It will be a new house, airtight and with good insulation. Planned thermal needs are ~8000 btu/ft2. Average temp nov-mar is 35f, year around 55f. Humidity is >40% at all times, except on the very rare times the temp drops below -10 Celsius (a week or two in a year at most). I agree with you than an HRV will be fine.